The University of Illinois Springfield is a school that strives to help students above all else, and Becky Prather is an employee that exemplifies how the staff take that philosophy to heart. For her efforts, she has been named the December Employee of the Month. Becky works closely with students who are veterans and she serves as the staff advisor for the Military Veterans Student Organization. She helps to raise awareness for veteran issues, and provides a place where these students can gain friends and find assistance with their educational efforts. She's is known among colleagues as a hard worker and someone who will step forward to take on any tasks that need to be completed. She stays late as necessary and is always accessible to students who need her assistance. As her nominator says, "Becky's first thought when she steps into work each day are the students." Dr. Bill Abler, chair of the Department of Human Development Counseling, is known for a calm and soothing demeanor, and often appears unfazed and even-tempered in any situation he's in. 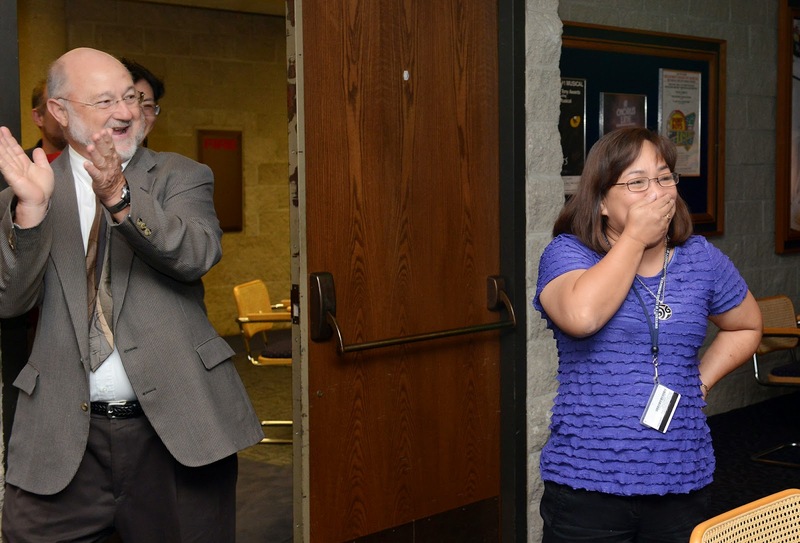 That calmness was on full display when he walked into a room full of friends and colleagues who were there to surprise him with the news that he had been named the University of Illinois Springfield Employee of the Month for November 2014. Though calm and collected, he did, however, take a moment to recognize the amount of "deception" that went into keeping this honor a secret from him. Bill's nominator made note of his kindness and his consideration for students and faculty. He treats people with respect; he is collaborative in his approach to solutions for the department, and his faculty trusts him. Bill's supervisor describes Bill as gracious and kind with a 'can do' attitude and a great sense of humor. "Dr. Abler's dedication to the department and the university is tireless," his supervisor writes. 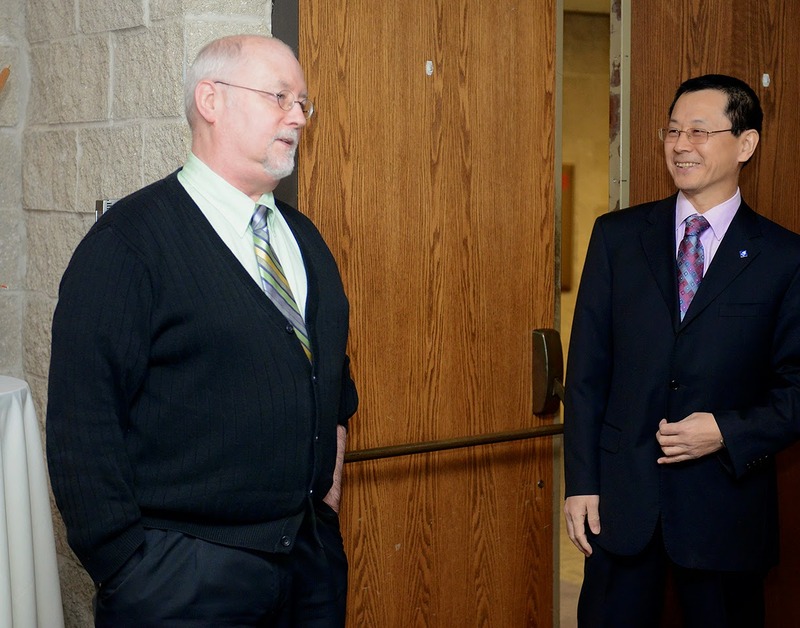 "He continually makes himself available to his students, colleagues, and administration. His work ethic, selflessness, and work output make him invaluable to CEHS." A go-getter. A consummate gentleman. Polite. Dependable. These are words chosen to describe Ted Mims, professor and head of the Computer Science Department. It is for these reasons and more that he has been selected as the University of Illinois Springfield Employee of the Month for October 2014. Ted has been with UIS since 1990. His nominator, who happens to be a student, says he has been more than helpful in making sure that students progress in their college careers in a manner best suited to the individual. "He does everything in his power to help the students in anyway he can. He shows a great love for UIS and shows great dedication to his work," his nominator writes. A colleague says Tim is great to work with; he oversees the largest program on campus without issue. He provides feedback when asked, but always with a smile and a positive attitude. 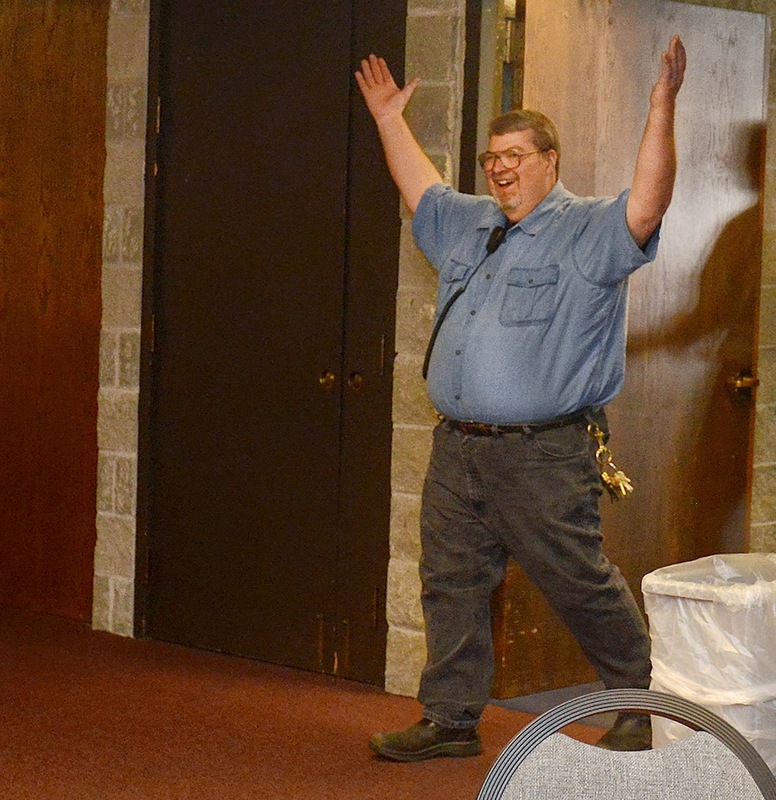 During his EOM surprise party, Ted thanked his colleagues for doing all they do to help students. As a Recruitment and Advising Coordinator for the Capital Scholars Honors Program, Karen Guthrie-Coleman works one-on-one with students, following up with those who need assistance, speaking honestly with parents, all while being empathetic and caring. For the past two years, she has helped the Honors Program reach its large recruitment goals. For these reasons and more, Karen has been selected as the University of Illinois Springfield Employee of the Month for September 2014. According to those who work with her, Karen always has a smile on her face and a positive attitude, regardless of how much stress she may be experiencing. She advocates for UIS and makes herself available for anyone who needs help, going so far as to walk first-time visitors around campus in order to help them find their destination. She also takes her work seriously, gaining the trust of parents and students, while helping others in her department with anything they need. "She is not only an asset to the Capital Scholars Honors Program, but more importantly to UIS. We are lucky to have her here," writes her supervisor. The University of Illinois Springfield and the College of Business and Management couldn't ask for a better representative than Joy Roberts. In all her interactions with students and staff, she maintains a positive and upbeat attitude, speaking highly of the university and the college. For these reasons and more, Joy has been selected as the UIS Employee of the Month for August 2014. Her nominator says Joy consistently goes above and beyond when assisting faculty and students. She is generous with her time, staying as long as needed to get the job done right, and she is respectful of those around her, keeping a positive attitude regardless of the situation. "Joy always greets everyone with a smile," her nominator writes. "She promotes the campus whenever she can, and her courteous attitude is always present when prospective students are looking for help or assistance." Joy is also the type of person who makes everyone's work day a little easier. "Joy is very dependable and if you give her an assignment, she very prompt and diligent on completing it and ensuring any follow up has been performed," writes her nominator. "Joy is a credit to the university, to the College of Business and Management, and to her department." Professor Beverly Bunch is an excellent example of Leadership lived. In addition to her work at the university--teaching, researching, chairing committees--she's also involved in the Springfield community. 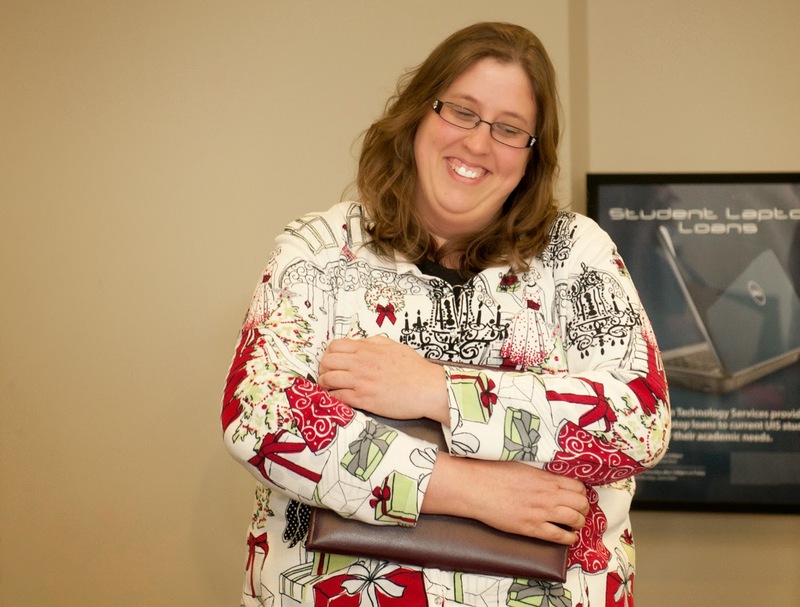 For these reasons, she has been selected as the University of Illinois Springfield Employee of the Month for July 2014. According to her nominator, Professor Bunch contributes a great deal of her time to university service, applied research, and is quite dedicated to her students. She also volunteers as a guide at the Lincoln Home National Historic site, and has been involved in community efforts to help the Springfield public schools with planning and finance. "Professor Bunch is a great example of our faculty who are engaged on campus, in their professions, and in the community, and who represent the spirit and actions of 'Leadership lived,'" writes her nominator. For many, Candy Tucker is the first face they see at UIS in the mornings. When students start making their way to early classes, or staff begin arriving for a day of work, Candy, the barista at Capitol Perks, is often the first person they stop to see. And more often than not, she sees them coming and already has an idea of what they'll order, asking if they want their "regular." 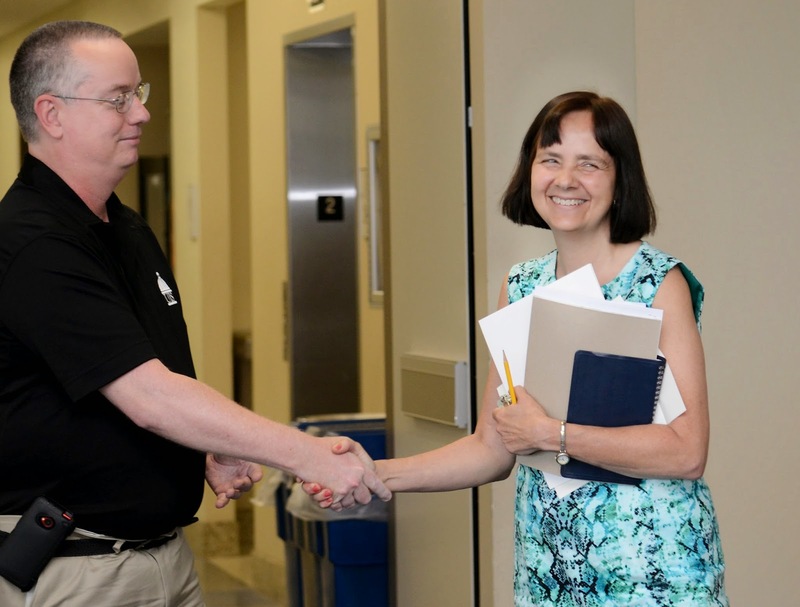 It's for her attention to detail, her hard work, and her friendly demeanor that she has been selected as the University of Illinois Springfield Employee of the Month for June 2014. In addition to anticipating what her customers want, she also answers any number of questions about the products she serves; she is fast and efficient when the line at Capitol Perks is several people deep, and when things are slower, she can be found cleaning the sitting area, leaving the space spotless. "Candy is highly reliable and committed to her job," writes her nominator. 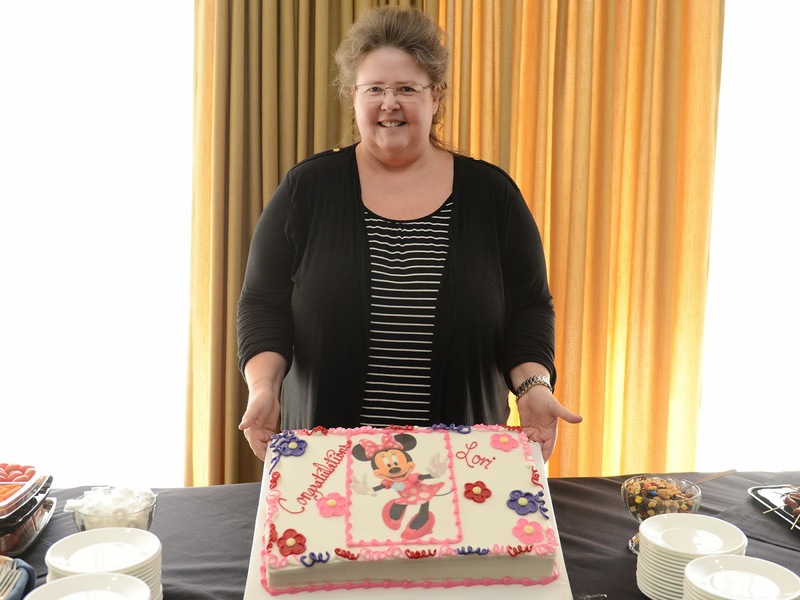 "She has taken ownership of her role as a Food Service employee and takes great pride in the service and products she serves... [she] greets all members of the university community with a smile and a positive attitude." 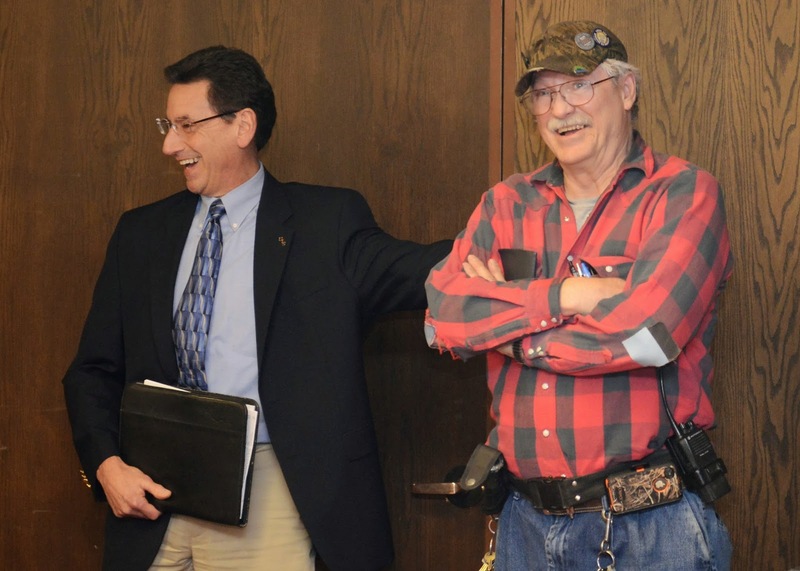 While Dennis Kreher was not surprised by the party in his honor (having mistakenly been informed via email of the surprise party), he was never-the-less happy to have been selected as the University of Illinois Springfield Employee of the Month for May 2014. "This is a great place to work," he told colleagues after walking into his party. He said his goal is to keep things running as smoothly as possible on campus so the students can have a positive experience at UIS. "It's all about the students," he said. His supervisor says Dennis has years of experience as an employee and a supervisor, and has the knowledge to resolve problems quickly and completely, often going above and beyond the requirements of a particular shift. "When he worked Saturday and Sunday, he did all the routine checks, plus ran all the emergency generators on campus, plus did fire preventive checks." "He is a good man, very knowledgeable, and easy to get along with," writes his supervisor. Danny Lau emanates kindness. He greets students and staff with a bright smile while serving some of the most popular dishes in Food Emporium. You can always tell when he's serving his fried rice by the number of people in line waiting to buy some. Because of his delightful personality, dedication to his work, and willingness to help however he can, Danny is the UIS Employee of the Month for April 2014. Danny's nominator noted that Danny greets everyone warmly, and he tries to be of help to international students, sometimes by giving them money out of his own pocket. He also shares words of wisdom to lift their spirits. 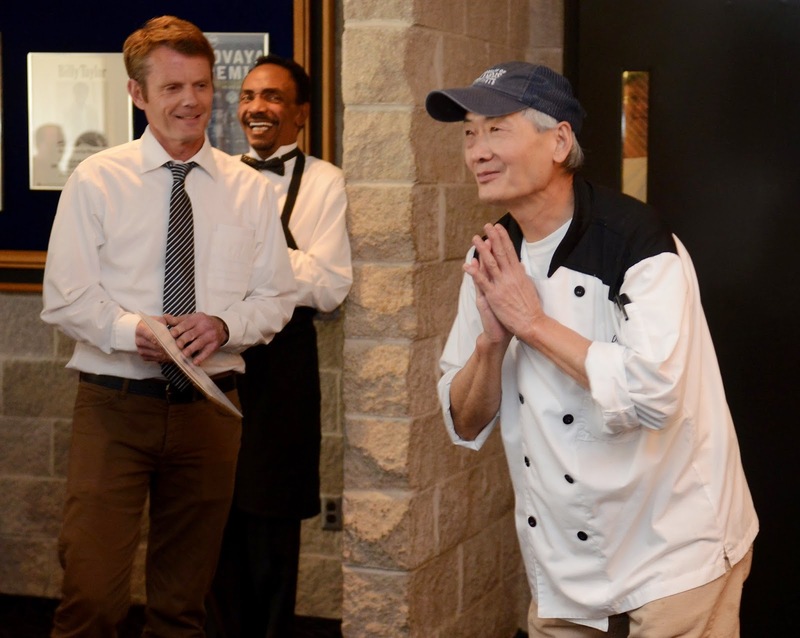 "It is for his grace, happiness, and general willingness to support everyone here at UIS that I nominate him for the EOM award," his nominator writes. His supervisor says Danny is willing to help whenever and wherever needed, and he never says a negative word about any task he's given. He always meets or exceeds the needs of the food services department. "Danny is an example of what we should be looking for in all our employees," writes his supervisor. Cecil Peveler has worked at UIS for fifteen years and takes great pride in managing the university's facilities. He treats the equipment he uses as if it were his own, and he works tirelessly in solving building-related issues for the school. For these reasons and more, Cecil has been chosen as the UIS Employee of the Month for March 2014. His supervisor describes him as one of the unsung heroes on the campus, working behind the scenes to keep the place running well. His nominator says he has the monumental task of keeping the creature comforts in campus buildings operational. "The next time you feel you are not too hot or cold, get food at the Emporium, or use a restroom, know that he and his team are behind the scenes making those things run as smoothly as they can with limited personnel and resources and they still get the job done." Not only does he get the job done, but he's a firm believer in working as hard as necessary to do so. His supervisor says he "comes from the 'old school,' where you always come to work, you always do the best job you can do and even though everyone may think that he's going above and beyond, he thinks he's just doing his job." nominator as one of the nicest people on the UIS campus. Others alternated between the words sweet and nice. It's for these reasons and more she was selected as the UIS Employee of the Month for February 2014. Lori is a human resources assistant at UIS, which means she regularly interacts with applicants, employees, and students throughout the day. Her supervisor says she has tremendous customer service skills, and remains positive and reassuring with everyone she encounters. "Lori is often the first point of contact for our applicants and new hires," her supervisor writes. She "projects a positive attitude and warm welcome to these folks, giving them a great first impression of UIS." 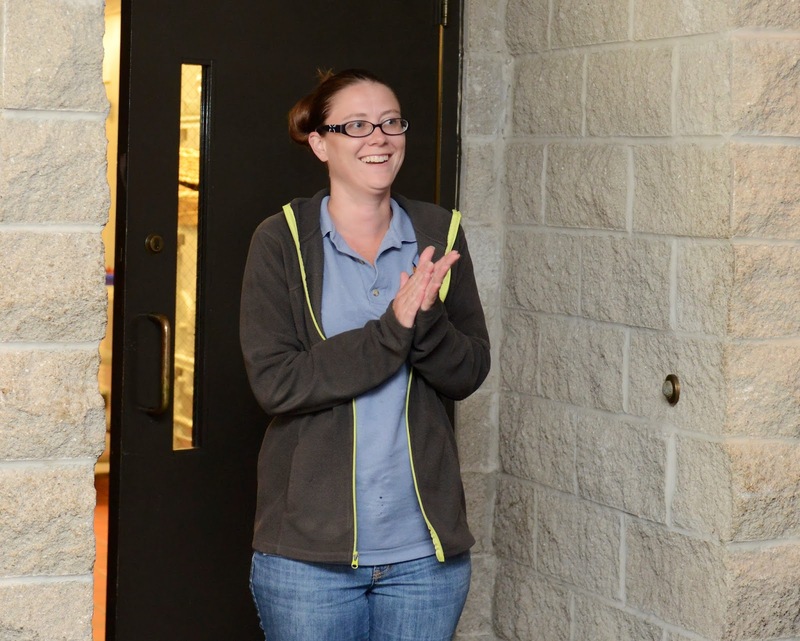 Her nominator describes her as the kind of person you want to hug because she radiates a love for what she does at UIS. Director of Conference Services Carolyn Neitzke was named the 2013 University of Illinois Springfield Employee of the Year during a celebration in the Sangamon Auditorium Lobby on January 29, 2014. Neitzke started working at UIS in September of 1990 and is known for her friendliness and sense of humor even when dealing with last minute changes and difficult situations. “It cannot be easy to maintain her welcoming nature and good sense of humor in the midst of the chaos in which she often finds herself and yet Carolyn somehow finds a way to do so,” writes another nominator. In presenting the award, UIS Chancellor Susan J. Koch thanked Neitzke and other UIS employees for their dedication and strong work ethics. 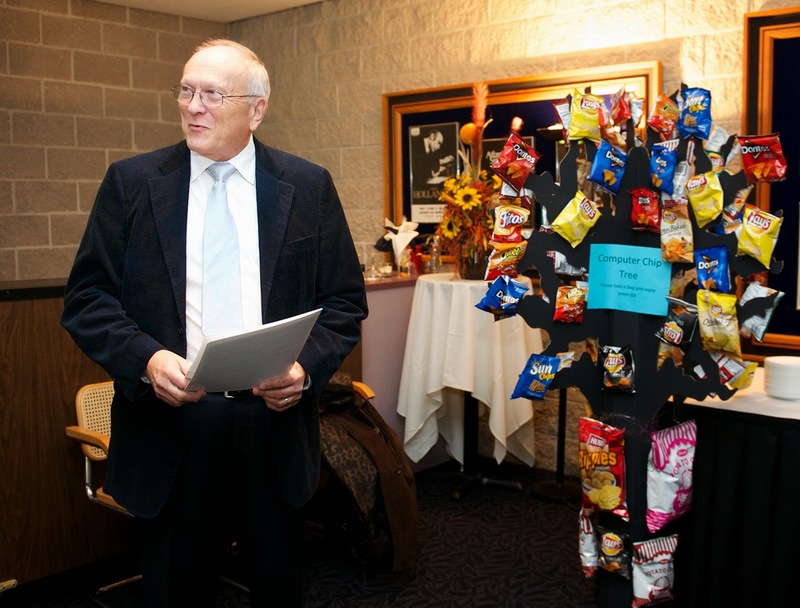 “By my count, I’ve witnessed over 30 people, since I’ve arrived, become employees of the month and everyone one of those people represents a great story, a great member of the team,” said Koch. Neitzke accepted the award by thanking her colleagues and speaking about her time at UIS. The Employee of the Year gets a check for $500, plus a special parking spot for the entire year.